The Gtk.TextView widget can be used to display and edit large amounts of formatted text. Like the Gtk.TreeView, it has a model/view design. In this case the Gtk.TextBuffer is the model which represents the text being edited. This allows two or more Gtk.TextView widgets to share the same Gtk.TextBuffer, and allows those text buffers to be displayed slightly differently. Or you could maintain several text buffers and choose to display each one at different times in the same Gtk.TextView widget. 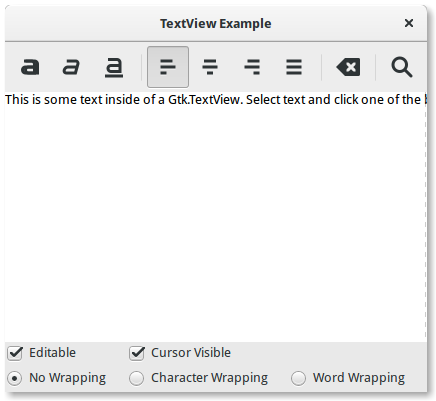 The Gtk.TextView is the frontend with which the user can add, edit and delete textual data. They are commonly used to edit multiple lines of text. When creating a Gtk.TextView it contains its own default Gtk.TextBuffer, which you can access via the Gtk.TextView.get_buffer() method. By default, text can be added, edited and removed from the Gtk.TextView. You can disable this by calling Gtk.TextView.set_editable(). If the text is not editable, you usually want to hide the text cursor with Gtk.TextView.set_cursor_visible() as well. In some cases it may be useful to set the justification of the text with Gtk.TextView.set_justification(). The text can be displayed at the left edge, (Gtk.Justification.LEFT), at the right edge (Gtk.Justification.RIGHT), centered (Gtk.Justification.CENTER), or distributed across the complete width (Gtk.Justification.FILL). Another default setting of the Gtk.TextView widget is long lines of text will continue horizontally until a break is entered. To wrap the text and prevent it going off the edges of the screen call Gtk.TextView.set_wrap_mode(). The Gtk.TextBuffer is the core of the Gtk.TextView widget, and is used to hold whatever text is being displayed in the Gtk.TextView. Setting and retrieving the contents is possible with Gtk.TextBuffer.set_text() and Gtk.TextBuffer.get_text(). However, most text manipulation is accomplished with iterators, represented by a Gtk.TextIter. An iterator represents a position between two characters in the text buffer. Iterators are not valid indefinitely; whenever the buffer is modified in a way that affects the contents of the buffer, all outstanding iterators become invalid. Because of this, iterators can’t be used to preserve positions across buffer modifications. To preserve a position, use Gtk.TextMark. A text buffer contains two built-in marks; an “insert” mark (which is the position of the cursor) and the “selection_bound” mark. Both of them can be retrieved using Gtk.TextBuffer.get_insert() and Gtk.TextBuffer.get_selection_bound(), respectively. By default, the location of a Gtk.TextMark is not shown. This can be changed by calling Gtk.TextMark.set_visible(). Many methods exist to retrieve a Gtk.TextIter. For instance, Gtk.TextBuffer.get_start_iter() returns an iterator pointing to the first position in the text buffer, whereas Gtk.TextBuffer.get_end_iter() returns an iterator pointing past the last valid character. Retrieving the bounds of the selected text can be achieved by calling Gtk.TextBuffer.get_selection_bounds(). To insert text at a specific position use Gtk.TextBuffer.insert(). Another useful method is Gtk.TextBuffer.insert_at_cursor() which inserts text wherever the cursor may be currently positioned. To remove portions of the text buffer use Gtk.TextBuffer.delete(). In addition, Gtk.TextIter can be used to locate textual matches in the buffer using Gtk.TextIter.forward_search() and Gtk.TextIter.backward_search(). The start and end iters are used as the starting point of the search and move forwards/backwards depending on requirements. Text in a buffer can be marked with tags. A tag is an attribute that can be applied to some range of text. For example, a tag might be called “bold” and make the text inside the tag bold. However, the tag concept is more general than that; tags don’t have to affect appearance. They can instead affect the behaviour of mouse and key presses, “lock” a range of text so the user can’t edit it, or countless other things. A tag is represented by a Gtk.TextTag object. One Gtk.TextTag can be applied to any number of text ranges in any number of buffers. Each tag is stored in a Gtk.TextTagTable. A tag table defines a set of tags that can be used together. Each buffer has one tag table associated with it; only tags from that tag table can be used with the buffer. A single tag table can be shared between multiple buffers, however. You can also delete particular tags later using Gtk.TextBuffer.remove_tag() or delete all tags in a given region by calling Gtk.TextBuffer.remove_all_tags(). self.textbuffer.set_text("This is some text inside of a Gtk.TextView. " + "Select text and click one of the buttons 'bold', 'italic', "